Tangled and True: i want to rock & roll. "the coolest announcements you will ever find! 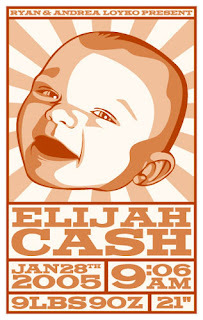 styled after gig posters for rock concerts, these announcements will stun your friends and family and stand as a great keepsake for the coolest kid on the block... yours." i love their unique style, coloring & the fact that each announcement will be customized with a drawing of your own little rocker. imagine the possibilities... birth announcements, birthday invitations, the list could go on & on. with no babies or birthday parties in my near future, i'm seriously considering having posters made of my two little guys - they would be soooo cute hanging in their rooms! check out all their offerings HERE. i love these! i think they are so clever. COOOOOOOOOOLLLLLLLLL!! Think I'll check em' out!! so cute. perfect for hip young 'rents. and oh so different from the norm. i love the idea of using an illo instead of a photo.